A game that I wished that I had discovered a long time ago is the Game of Thrones: Living Card Game. In A Game of Thrones, each player takes a deck representing one of the four main houses (expansions add more houses) in the Game of Thrones book series (by George R.R. Martin). From here, the game is played in a series of turns until one player has collected 15 power. First, each player selects a plot card and reveals it at the same time - the plot cards have an immediate effect, but they also determine how much gold each player receives, what each player's initiative is (who goes first), and what each person's claim value is (how much damage their house does in combat). Next, players draw two cards and have the option of playing any cards from their hands - characters, attachments, etc. Next come challenges. In initiative order, players have the option of challenging their opponents in three different areas - military, intrigue, and power. Both attackers and defenders have to "kneel" (turn the card to the side) in order to participate in the challenge. If an attacker successfully wins a military challenge, the defender must lose characters equal to the attacker's "claim" value. Intrigue challenges force the defender to lose cards from his hand, and power challenges force the defender to give power from his victory pile to the attacker. Plus, any undefended challenges gain a power for the attacker. After each player gets to take his turn initiating challenges, players compare how much gold and "standing" (non-kneeling) characters they have; whoever has the most gains an additional power. Finally, all kneeling characters are returned to standing, and any leftover gold is discarded. Play continues in this manner until one of the players has gained 15 power - that player is immediately the winner! 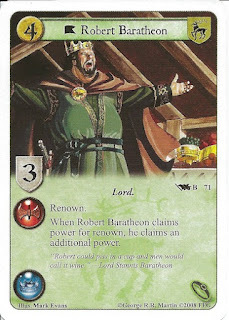 There are several things that I love about the Game of Thrones card game, but the first is the plot cards. I have not seen anything like plot cards in any other game that I have played. The plot cards have a lot of strategy in several different ways. First, they determine how much gold a player has to spend; but the more gold you have, the lower your initiative value probably is. You also have to decide when to play your plot cards with higher claim values - they can be incredibly powerful in stretching an advantage, but if your opponent is able to keep you from winning any challenges, then it doesn't matter how high your claim value is! 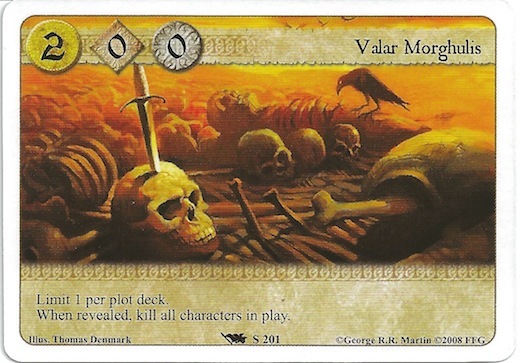 Finally, the plot cards can be great equalizers if one player is gaining too much of an advantage - one plot card (that comes with the House Stark deck) states "When revealed, kill all characters in play." This card can be phenomenal when your opponent has a distinct advantage; yet putting it in your deck means that you will have to play it at some point, even if you are the one with the advantage. The next thing that I love about the Game of Thrones card game is how the challenges work. This works well with the initiative, because if you are able to get a higher initiative, then you can be the one forcing your opponent to react to your moves (after all, if you attack first, then you might be able to kill some of his characters before they have the chance to do anything - or at the very least convince him to kneel some of his characters to defend). Each of the different challenges are very strong, but in entirely different ways. Military is phenomenal and straightforward - if you kill your opponent, then they cannot attack or defend. Yet, with intrigue, you can prevent your opponent from bringing in reinforcements; or from hitting you with a nasty Event. Power, finally, wins the game. Regularly defeating your opponent in power will keep him from ever being able to gather enough power to defeat you - while helping you grow ever-closer to victory. These different strategic elements give an abundance of different strategies when building decks, but they also are critical during gameplay. Each turn you must decide how many characters you want to commit to which challenge - sometimes attacking simply to force your opponent into defending, and sometimes pressing all of your attack into a single challenge that you know your opponent cannot prevent. Once you have mastered the challenges in Game of Thrones, you will be a very skilled player! The next thing that I like about Game of Thrones is that you truly are playing a game in which your cards represent characters - they are unique. Game of Thrones takes this uniqueness a step further than any other game that I have played. In Game of Thrones, if a unique character dies - he is dead. He cannot be played again, and he is placed in a separate discard pile. This makes deck building more interesting, as you must decide whether a single character is valuable enough to put multiple copies of in your deck - and if it is that important, you need to make sure that you protect that character, or else you will have extra cards that you cannot use later in the game! Finally, I believe that the decks that come with the core set of Game of Thrones are well balanced and provide enough strategy that the game is enjoyable, even with a single core set of cards. If you are not intending to play in tournaments (I'm not), then you could play the game with just the core set, and you would really have a very solid game. With all that is right with Game of Thrones (I basically love every part of the gameplay), there are a few things that I wish were different. These things are all related to what is included in the core set. For example, though each card can be included in a deck up to three times, you do not have three copies of each of the cards - in order to get these, you have to buy the game three times. 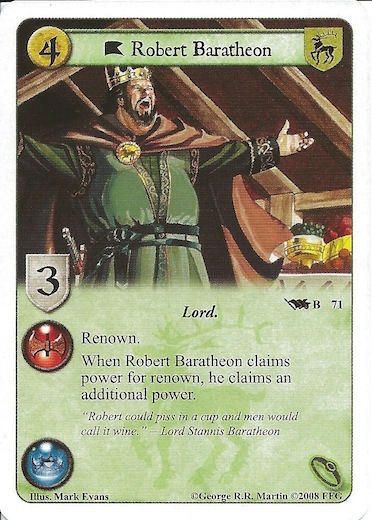 Yet, some of the cards are included multiple times (such as Robert Baratheon), so if you did buy three copies of the core set, your extra cards would be worthless (this isn't nearly as bad as in the Lord of the Rings LCG in which you have a lot of cards with two or three copies; in Game of Thrones, most of your cards only have a single copy). Also, though a tournament legal deck consists of 60 cards, the core set provides you with four decks of 45 cards. I wish that you had decks that were legal to play in a tournament, even if the decks weren't tournament-quality. Finally, the game is setup out of the core set to be mutliplayer, and several of the cards are only useful in that kind of game. Yet, the game is incredibly fun two-player (this is how I play it and how I believe it is played in tournaments), so you immediately need to modify the decks for two player, or just play with certain cards not having much value. Overall, I give the Game of Thrones: Living Card Game a 9.5/10. The gameplay easily deserves a 9.5, and the small nuisances of the core set are trivial enough to not drop the total score. Plus, the great news is that Fantasy Flight (I believe) is releasing all of their new expansions with the three copies of each card that you need, and are even re-releasing some of the older expansions to have this same three-copies of each card format! I truly look forward to continuing to play this game, and I really hope that I have several friends that fall in love with it so that I can have people to play against. 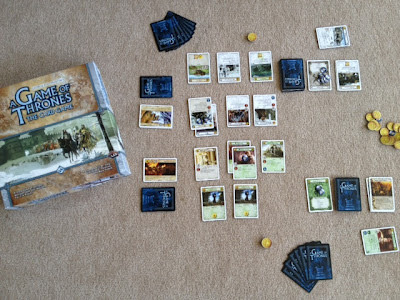 If you enjoy the Game of Thrones: Living Card Game, you might also check out the Game of Thrones Board Game, the Lord of the Rings: Living Card Game, Star Wars: Living Card Game, and possibly Summoner Wars. Excellent review Josh, I loved the game at once as well. I've had a few cons that I found to the game myself and was wondering as to your opinion of them. 1. The roles. Besides giving you special bonuses, some roles prevent you from attacking certain players and allowing you to protect other players. Personally I felt that was the weakest part of the game. Based on an proponent's initiative, they can completely prevent you from attacking them. 2. Valar Moghules. Even though I played Stark with my friends, and can definitely see how Valar Moghules is an amazing card, it's absolutely terrible how much it slows down the game. It turned our 45 minute game into an hour and thirty minute game just by me playing that plot card. It's also the least fun card for the other players, basically other players build up, and instead of countering with your own players, you just cancel it out all out. One might compare it to a "Wrath of God" card from Magic the Gathering, but in MTG you already have all your lands to tap for mana, while in Game of Thrones essentially the entire game restarts all over. Also, with Bran Stark in play, you can make it come over much faster. 3. Rule book!!!! The rule book is based with expansions in mind, but I did not own any expansions and when the rule book says Step 1. Do X, but X is an expansion card, its gets extremely complicated. Sorry about the long rant, but I'd love to know your opinions on these issues. 1 - I must admit that I've never bothered using the roles. I bought this as a 2-player game, and love it that way. I haven't played 4-player yet, though I would like to at some point. I firmly believe that the "official" way of playing this is 2-player, even though the game includes all the 4-player stuff, which is why I went ahead and wrote a review without having tried that (though some would say shame on me). 3 - I sometimes get the impression that Fantasy Flight has a page minimum on their rulebooks. The last several pages of mine were all advertisements. I wish that it had a better glossary and index. I also wish it had an FAQ, as I've had to look up what several of the cards do online. However, for understanding the basics of the game, I thought that it was fine. But your response above indicates --- No, we weren't playing the same game at all! :D We were playing a four-player game (since there are four houses and the box says it plays four). We were using the roles (since they weren't marked as an expansion --- although they certainly *feel* bolted on). In other words, we were treating it like any other multiplayer FFG game, whereas you seem to be treating it as a MtG-alike trading card game. Sounds like your approach to the game was certainly the right one! People who like MtG-alikes will probably like GoT much better than I did. But my impression was that it was marketed by FFG as a multiplayer game, and it's certainly not any good like that. P.S. - I've also played the earlier "Game of Thrones" board game once (the one played on a map of Westeros). It *is* a designed as a multiplayer board game, and I liked it quite a bit. Yeah. The game started as a CCG and was then converted into an LCG. I think that when it converted is when it got all of the multiplayer stuff added on, I'm assuming as a marketing excuse from FFG. I can't really speak for it and whether it's any good, but the basic game itself I thought was phenomenal! Don't mean to sound stupid, but what is a "living card game'? I know what a CCG is, but I have never heard of a LCG. Very fair question (and one that I should have really address up front, I'd say). A "Living Card Game" is very similar to a CCG in that you are able to customize your deck and that there are regular expansions. The gigantic difference, though, is that those packs do not have random cards - you are buying a standard set of cards. Currently FFG is either the only (or at least the most prominent) company that has converted to the LCG format. They typically release a core set (which is what I reviewed here), and unfortunately often expect you to buy 2-3 of these to have a "full" deck (the con that I mentioned was that you only got 45 cards per House, though a "full" deck was 60). From there, they will release a small "chapter" or "adventure" pack every month that retails around $15 and has about 60 cards (they've finally converted this to have all of the copies you need for a full playset (the number of cards you can legally put in a deck) in each of these - kudos to them for that), so you only need to buy one of each of these. They will also put out a larger expansion set every 4-6 months that retails around $30 that is like a chapter pack, but has a lot more cards - they normally do this to give you enough cards to introduce a new theme (in Game of Thrones, I believe they are centered around the different houses, so you can buy one to improve your House Stark cards for example - I think this is also how they included House Martel and another House that don't have any cards in the core set). Does that help? A different kind of review. Never seen something like this before. Congrats. Good one. Nice writeup, Josh. I'm looking forward to playing the 2-player variant myself, but I had our first experience with the game (using the 4-player rules) ourselves this weekend and my experience definitely was different than yours. A good game, yes, but not a 9.5 to be sure! The main (and one of the few) real gripes that I had with the game was that in 4p mode, our game quickly became an arms race with no one willing to kneel any players to initiate a challenge, because they never wanted to leave themselves open to attack. So instead, we kept playing creature after create plus attachments after creature. Especially when playing with roles (+2 gold for a round is quite helpful) and once we each had Locations that could make creature gold costs or other card gold costs cheaper, we didn't find it difficult to drop more things every turn. While one would think that the three different "types" of challenge would make things simpler in some ways, we found it made it MORE complex in that you kept trying to come up with all the different types of challenges you could initiate or defend against. Personally we enjoyed the roles in the 4p game. The additional level of strategy made the game very interesting: you're not just picking a role for its specific abilities, but sometimes for the supports/opposes traits to ensure an opponent cannot challenge you this turn or so you can gain bonus power by winning challenges against a particular player. And by the order of choice once again going back to initiative order, it makes that choice much more difficult for the player who wins initiative. While it's obviously advantageous to pick a role first, we found that many times it was preferable to be late in the round order for the Challenge phase, since you knew what the landscape looked like and could challenge without fear of leaving yourself open to challenges later in the phase - obviously you are at the mercy of everyone else's challenge phases first, but it's still a tactical decision to be made (which our group enjoys). As a group of rules-lawyering former MtG enthusiasts, we definitely enjoyed the game. More card and game flow familiarity, and I think it could be quite enjoyable. The rules on the whole WERE well-written and fairly bulletproof (which is always nice when people start trying to find logic holes with how cards interact with each other or with the game rules). But first-play gametime was well above box time, so I'm hoping that doesn't scare people in our group off from a second play. Thanks for your thoughts, Dave. You definitely make some very good points, and I'm ok with you disagreeing about my 9.5 score - if you agreed with all of my scores, it'd be pretty weird! I also think that if you played it 2-player (which my review was based off of) you would have less of the arms race feel. In 2-player, it is much more important to start challenging your opponent (especially if you have initiative), because it forces them to kneel characters to defend, which then means they have less to attack you back with. I would say that many games like this can turn into arms races in multiplayer (MtG can do that, too). Overall, I'm glad you enjoyed the game, and I hope that you get to play it some more. As for me, I've already bought another core set, and 3 of the "big box" expansions - I hope that I can convince people to play them with me! I too bought the game for the 2 players version to play with my son, we have a blast althoughh still playing with core and expansions set for martell and greyjoy. then 1 day i joined a group playing 4 ways. What a pain. Too much going on, you need to know all the cards younhave and your opponents to know what kind of combos they can pull and how to defend, otherwise you just get smoked. Not fun, too slow, but probably more strategic than PvP. I just started playing this game recently, because my friends and I are big fans of the books/show. Though I think it is very fun, it is also incredibly complex. Though much of this can be blamed on a fairly lackluster and incomplete rule book that comes with it, I think there are just too many variables in play for anyone to learn it overnight. What I do like is that each house is very different in terms of strengths and weaknesses. The artwork is nicely done, and the cards are of good quality. It also has the fun of a game like MTG because you never know what's going to be played next. It's almost as much fun just making a deck you like than playing the game itself. Multiplayer can be extremely frustrating, primarily because of the roles. You are almost always going to be ganged up on, not just because sometimes it is greatly beneficial but because the roles force you to. It can be very frustrating when you can't attack anyone but they can all attack you. It may work better if the roles were just left out of multiplayer altogether. Two-player is much faster and easier to navigate (assuming you know the basics of the cards). Lastly this game can be more expensive than your average board game. Like Josh said, the core game alone is probably not enough for your enjoyment, because there aren't enough copies of cards to go around. I've pretty much bought only the core essentials (two core boxes plus the Greyjoy and Martell expansions), and I'm already over $100.